These false 1UPs definitely fooled me in Super Mario 3D Land–I felt like a dope repeatedly walking into one. 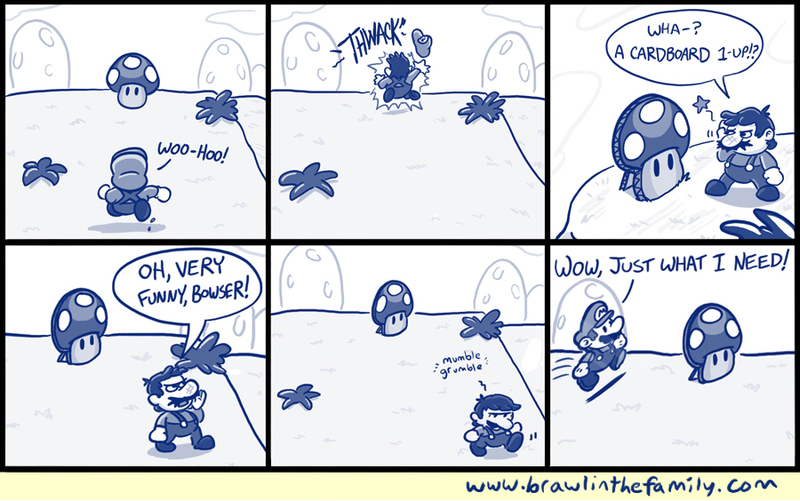 Today’s strip was originally goofier, featuring a cardboard, silly-looking Mario in the last panel. I liked the idea but having a flat Mario would immediately bring some confusion in regarding Paper Mario, so the strip ended up changing to reflect that. Although now, other questions are raised, particularly about Paper Mario himself! But hey, if Mario can battle his own doctor form, anything goes. Super Mario 3D Land is fun as heck, gentlemen. It plays quite a bit like the more linear Galaxy stages (or the Super Mario Sunshine void levels), minus the gravity element. But it retains some of the tighter 2D Mario aspects at the same time, such as the powerup system, and the result is something rather fresh and every bit as fun as a Mario game should be. I don’t even mind the Tanooki Madness! I’ve played the heck out of Kirby’s Return to Dream Land, and on one of my favorite gaming sites, also posted a very thorough review from the perspective of a longtime Kirby fan. Check it out here at Negative World! If you’re looking for great gifts for the holidays, check out our online store! We’ve got holiday discounts on everything, so surprise that special someone with a precious Dededoll or a heroic World’s Best Hero mug!